RICHMOND, Virginia, February 8, 2011 (ENS) – Virginia is about to limit state regulators’ ability to protect public health and the environment from toxic discharges entering state waters from surface coal mines. The Virginia Senate today passed legislation (SB 1025) that limits the ability of state regulators to use water quality testing to make permitting and enforcement decisions involving polluted discharges from coal strip mines under the Clean Water Act. An identical bill (HB 2123) passed in the House of Delegates last month, and Governor Bob McDonnell is expected to sign the legislation into law. Strip mining, including mountaintop removal mining, is more widespread in Southwest Virginia’s Wise County than all but one other county in Appalachia. Discharges from strip mines pollute downstream waterways and discharges from mountaintop removal mining operations are of particular concern, say opponents of the legislation. The bills revoke the citizen State Water Control Board’s primary authority for administering the Clean Water Act’s National Pollution Discharge Elimination System, NPDES, permits for surface mining discharges. The legislation transfers this authority to the Department of Mines, Minerals and Energy. The legislation states that any total maximum daily load, TMDL, that has been established for the receiving body of water shall control the determination of whether or not to grant a permit for the discharge. If no TMDL has been established, the director “may” consider biological monitoring, chemical monitoring, and whole effluent toxicity testing, the bill states. TMDLs, which are plans for controlling pollutants in each water body, are required under the NPDES provisions of the federal Clean Water Act. The federal government delegates this authority to the states in all but a few cases. Environmentalists warn that Virginia could lose its authority to administer its own TMDL program as a result of this legislation. “By hamstringing the director’s ability to adequately test water quality, this bill removes safeguards for clean water,” said Marirose Pratt, an attorney with the Southern Environmental Law Center. “It conflicts with Virginia’s longstanding agreement with EPA and places Virginia in jeopardy of losing authority to administer our own Clean Water Act program,” said Pratt. 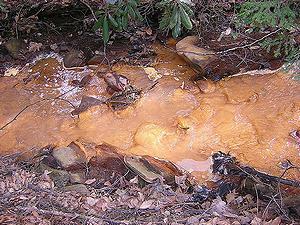 Environmental groups also worry that pollutants in Virginia streams will increase if the legislation is enacted. “Stream monitoring and testing for toxic discharges are indispensable tools for enforcing clean water laws, and that is precisely why Big Coal is going all out to curtail their use,” said Tom Cormons, Virginia Director for Appalachian Voices. The journal “Science” cited Virginia in a peer-reviewed paper last year on mountaintop mining impacts. The paper describes declines in stream life and high levels of toxic metals below mine sites, as well as elevated rates of human mortality, and heart, lung, and kidney disease in the vicinity of mountaintop removal operations. “What’s astounding is that the General Assembly has passed this coal industry bill, tying our own state regulators’ hands by restricting their ability to use standard water testing,” Cormons said. Passage of the bill points up a fight among Democrats in the State Senate. The Senate bill was introduced by Phil Puckett, a Democrat. But Senator Patricia Ticer, a Democrat who chairs the Senate Agriculture, Conservation and Natural Resources, opposes the bill, along with Democratic Senators Mary Margaret Whipple, Donald McEachin, Chap Petersen, and Dave Marsden, who also opposed the bill in committee on Monday.